Fruitvale was originally named Beaver Siding in 1893 as it was a railway stop for the Nelson and Fort Sheppard Railway (later acquired by the Great Northern Railroad). In 1906, Fruitvale Limited purchased a great deal of land on both sides of this stop. As a bid to attract settlement in the area, Fruitvale Limited change the name to Fruitvale. Sadly, the new settlers found that the growing season in Fruitvale was not long enough to be prosperous. Although the community is over 100 years old, Fruitvale was formally incorporated as a Village on November 4, 1952. Fruitvale has now blossomed into a bedroom community of approximately 2000 people, offering a small town, rural setting with many services and amenities for residents who work and play throughout the region. Fruitvale is a full service community with retail, grocery, financial institution, medical and dental clinics, physiotherapy and massage therapy offices, pharmacy, veterinary services, service stations, post office, bowling lanes and a 300 person capacity Memorial Hall in a compact, pleasant downtown centre. There are several parks and playgrounds, baseball complex, soccer fields, ice arena and all season sport courts. Check out the clubs/community organizations listing and/or the business directory for more information about amenities. The information listed is the most frequent of our records that apply within the Village of Fruitvale and is provided for convenience and information only. Every effort is made to ensure the accuracies of this information. The Village of Fruitvale will in no event be held liable or responsible for damages of any kind arising out of the use of online copies of information. 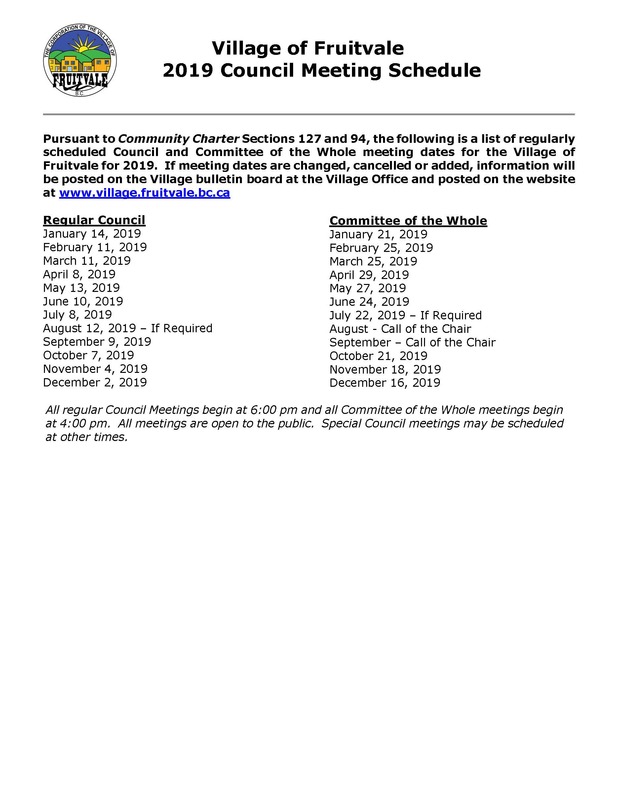 For more information on the Village of Fruitvale, please contact the Village Office at 250-367-7551.